Rainwwater is the best that can be had; free of chemicals, it is the best for watering plants. Additionally it can be used for water features. 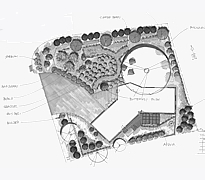 There are many options to recirculate the water feature with a rainwater holding area. 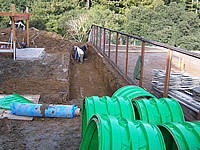 The first image below shows layers of a rainwater harvesting system that uses water captured directly under the plant material (in this case a 4000 square foot area of lawn and perennials). Site is laser leveled. 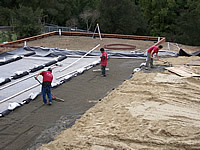 Then a EPDM membrane is placed along with chambers to store and transfer the water. Next a fine layer of gravel to set the chambers, followed with washed golf course sand. 2.5 gallons of water are captured and stored for every square foot of system. This water goes directly to the plant roots through the capillary (water travelling upwards) action of the sand. 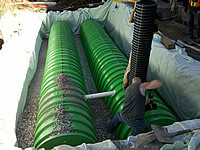 Compost and fertilizer can be added to the surface, or fertilizer can be added through the chambers. Because the sand provides different levels of moisture, arid and boggy plants can be planted adjacent to each other, providing unique plant combinations. This system uses 50 to 70% less water than a conventional spray system. This type of underground watering evenly distributes throughout the whole soil profile, unlike conventional drip, which can be spotty at best. The second image shows excavation, liner roll, and water storage chambers. This type of underground rainwater system can bear car traffic if needed. Many green builders prefer this system to others because of the use of soy plastic for the chambers. We have found them to be very strong, and they require far less effort to construct compared to rain boxes. 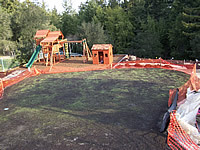 From here a layer of gravel covers them along with more liner, and a port is installed for the pump.